Plus: Clan co-leadership, minion & spell boosts, and game tweaks galore. Both the iOS and Android versions of Supercell's Clash of Clans have just been given a massive update. The new content includes additional hero abilities, new functionality for clan co-leaders to be appointed, and plenty of UI and gameplay tweaks. The complete list of changes in version 5.113.2 is reproduced below, and you can grab the game from the download links further down the page. All hail new Hero abilities! - Both Heroes have acquired special abilities that can be activated once per battle, after they have been deployed. - Iron Fist: The Barbarian King and nearby Barbarians become enraged for a short time, moving faster and dealing more damage (does not stack with the Rage Spell). - Royal Cloak: The Archer Queen hides from and becomes invisible to all enemy defenses for a short time. 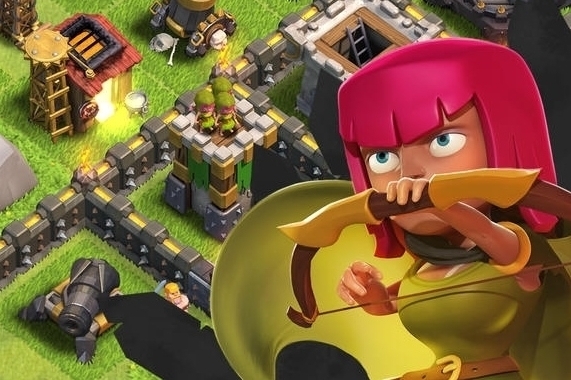 - Both Hero abilities will instantly call in a group of Barbarians or Archers to reinforce their King or Queen. -Hero abilities unlock for free at Hero level 5 and improve in strength every additional 5 Hero levels! - Level 6 Minions are here to wreak havoc on enemy bases! - Level 5 Freeze Spell leaves defenses on ice for longer than ever before. - Get your Heroes back into battle faster by boosting their recovery 4x while sleeping. - Boost cost and duration of Barracks and Spell Factory now reduced from 4 hours/20 gems to 2 hours/10 gems. - Clan Co-leaders can now be appointed by the Clan Leader or other Clan Co-leaders. -Clan Co-leaders have all the privileges of Clan Leaders, except for the ability to demote or kick other Co-leaders. - Clan Elders are now less powerful to prevent abuse, no longer able to promote or demote and only able to kick normal members. - New plant growth is being found with more gems inside than ever before! - Mysterious boxes packed with gems are being reported all throughout the realm. Keep an eye out for them! - Chat is now available even when away from your village, such as when visiting and watching replays. - Army Camps, the Spell Factory and Clan Castle now display used capacity next to their name when they are selected. - Clans tab (Search Clans is still available from the Clan Castle menu). - Rage Spell info now correctly indicates damage percentage increase (e.g. 30% instead of 130%). - Obstacles can now be cleared in edit mode. - Decreased the upgrade cost and time of Freeze Spell levels 3 and 4. - Decreased Rage Spell level 5 damage bonus from 80% to 70%. - Increased Hog Rider training cost by about 30% on all levels. - Increased Valkyrie hitpoints by about 20% on all levels. - Increased Pekka hitpoints from 3400 to 3500 on level 3 and from 3800 to 4000 on level 4.